Hi lovelies! 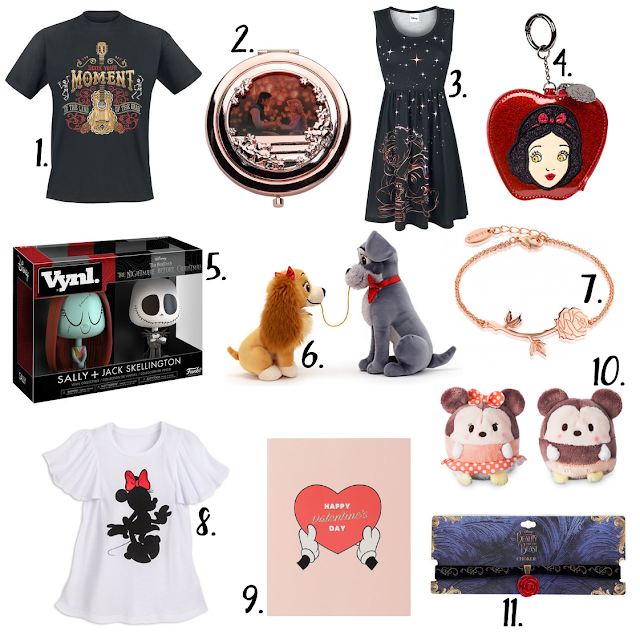 With only a few more days until Valentine's Day arrives I thought I'd share a Disney gift guide for anyone who needs a little inspiration for the Disney fan in their life! I've included quite a few things from EMP who are actually currently running a discount code on their Disney range for Valentine's Day! Just spend £20 and get 15% off your order with the code "EMPUKDISNEY15", valid until 11:59pm on 11th Feb! If your partner loves a good t-shirt then how about EMP's Coco T-Shirt (#1 - £12.99) or the Disney Store's Minnie Rock The Dots Ladies' T-Shirt (#8 - £16.00)? Both of these are shiny new releases so hopefully they shouldn't have already picked one up for themselves! EMP'S Beauty and the Beast Sparkling Dress (#3 - £32.99) and Beauty and the Beast Rose Choker (#11 - £7.99) would also make the perfect Valentine's dinner outfit! If accessories are more their thing then the Disney Store currently have lots of lovely Danielle Nicole bags and purses in stock like this lovely Snow White Coin Purse (#4 - £12.00). I have one of these and it looks and feels like it should have cost ten times the price! There's also this lovely (and romantic!) Tangled Pocket Mirror (#2 - £12.99) from EMP. And if you'd like to go a little more traditional, this beautiful Beauty and the Beast Rose Gold-Plated Enchanted Rose Bracelet (#7 - £27.00) from Couture Kingdom should be just the ticket! If you're looking for a more of a gift-type present then the Disney Store's Lady and the Tramp Soft Toy Set (#6 - £20.00) and Mickey and Minnie Ufufy Mini Set (#10 - £6.00) are ridiculously adorable choices! And for those Tim Burton fans, these Sally + Jack Skellington Vynl Figures (#5 - £19.99) are a lovely alternative to the usual Pop-style figurines! And finally, Typo have reduced this Mickey Valentine's Day Card to only 50p! Bargain!